Open Europe: Who will win the race for the most anti-EU MEPs: Farage or Le Pen? Why not be a bit creative and allow some candidates to defect across? Do it from both directions and both groupings will be large enough to form separate groups... Still voting according to party-loyalty. Would it be legal, would it be acceptable by voters? If it is legal, then maybe it is yet another reason to reform the treaties. 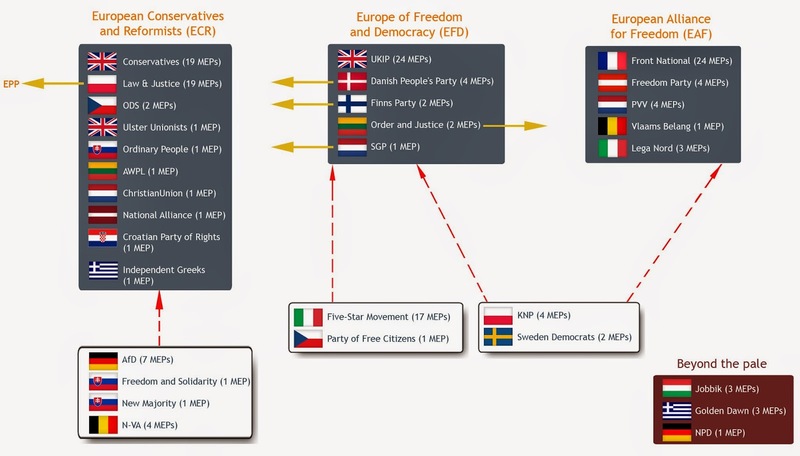 You don't belive that the MEP from the Family Party (Germany) will you EFD or ECR? Good question - to be honest we don't know enough about the EU stance of Die Familienpartei at the moment to place them in one of the groups but we will look into it. Form a single group that votes anyway they please (as long as it's anti-EU;-)). Or some parties could allow members to defect and join the other camp in return for some sort of a favor. The UKIP must distance itself from any hint of Fascism, and cannot enter with any right wing extremists. UKIP is often described as right wing; it is not so. Really not quite sure just how Open Europe or anyone else for that matter views le Pen and the FN as a Right wing group. FN, by definition is a Party which wants a lot more State Control, a singularly Left wing illness. Further, FN's views on the economy, banking and Finance, put her somewhere to the Left of Mao....or Barroso. There is deliberate media mischief in these "Right Wing" labels. UKIP with its very successful appeal to the working class voters can hardly be termed "Right" wing. I think these very misleading and EU authored 'tags' fit in with the EUSpeak of "Populist, Extremist and Right Wing" defences against any group of decent citizens who wish to bring down the almost Nazi state of the EU. Korwin Mikke did not say that. You are just repeating all the trash which Polish media are realesing.You should be sued for saying not truth. Korwin Mikke is free market conservative. Next time if you are going to write something, look for the information from the first hand. Korwin Mikke HATES hitler. Thank you.